I decided I was going to knit as long as I could bear to, and then report in. Which worked out well — I finished the front half of the shell cardigan pattern I was following! 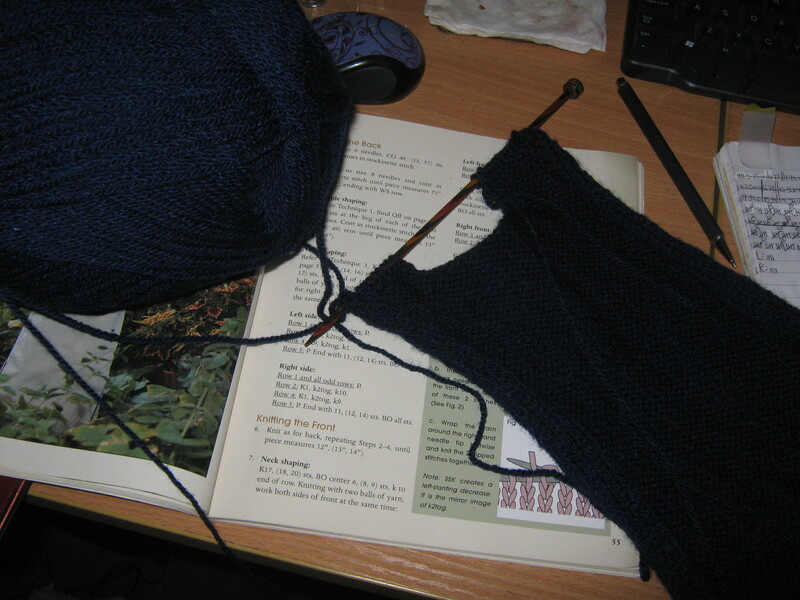 I felt the need to try to ‘make up’ for not having the ‘right’ needles; I needed to order a proper pair of Knitpros, ’cause metal and bamboo weren’t cutting it. Nearly done with the back. Front and back (mainly) completed! I thought the hardest thing was going to be picking up how to do slip slip knit (SSK), but I found a good left-handed video for that. No, what’s going to stymie me is the next step — learning how to pick up stitches for the neckline. I’ll have to start hunting and pecking around, and see what I can find to assure me that I’m not going to screw everything up when I next pick up my knitting. The other ‘new’ thing I picked up was binding off stitches in random places. 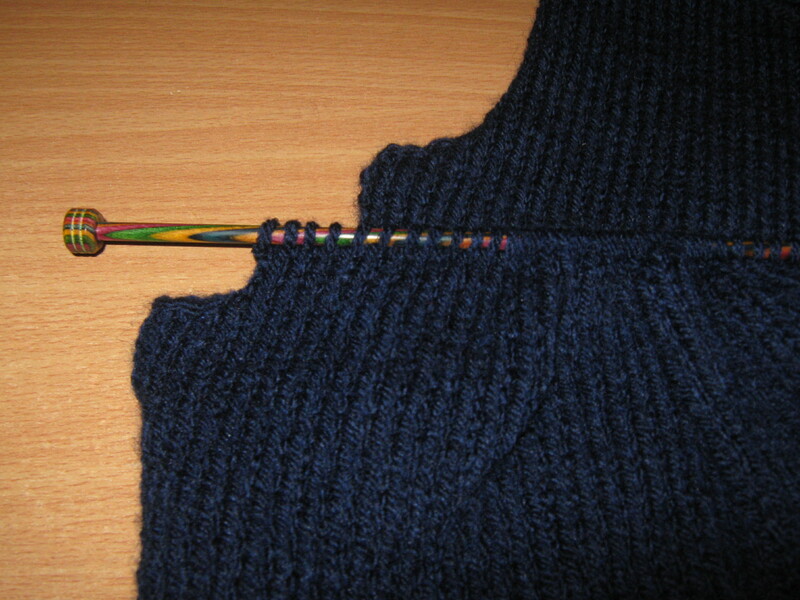 To make the armhole shaping, I had to bind off four stitches at the start of two rows in a row. I didn’t quite get it right on the back, as demonstrated by needing to drop an extra stitch in each of the following rows… but hey, it’s on the back, and it will be fine. 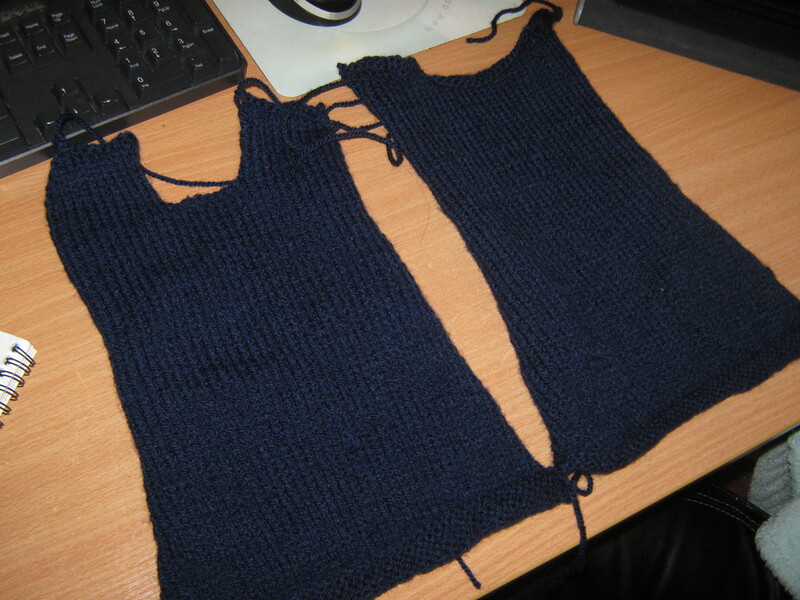 At least I figured out that my counting wasn’t quite right by the time I did the necklines above! I also did some corrective work on the cardigan I finished earlier in the week. I talked with my husband, who is much better at sewing than me, and he suggested that I just sort of seam over it to round it back over. So it’s ended up with slight padding on the inside, but the actual way it sits on my kiddo’s shoulder doesn’t look like she’s walked out of some dystopian future that has some obsession with squared-off pointy shoulders. And really, should I ever want to do the pattern again, at least I know which way to do the shoulders, so that’s good — I learned something. 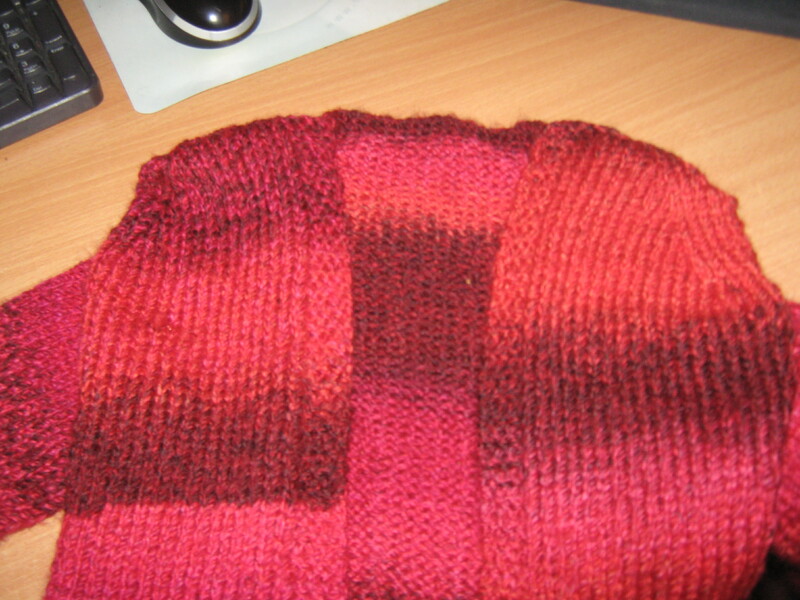 And I very well might make it again, because it’s a very cute little-person sweater, and isn’t that difficult to make. So anyways, hooray progress. 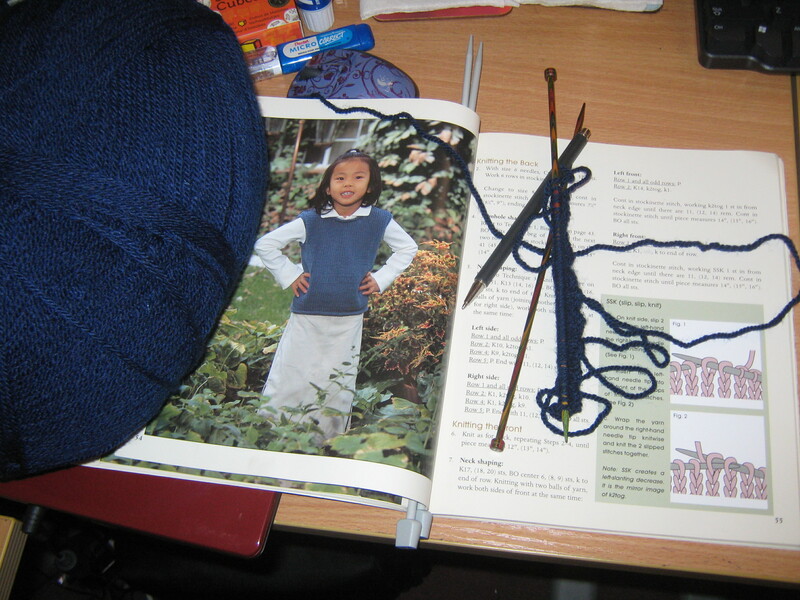 The next thing in the book is booties on three needles, so that should be interesting. And, of course, gives me a random something to gift randomly out to my friends across the world, which is always faboo. I also have to say, since I’m not sure I’ve said it explicitly, but I think that knitting is turning out to be great for my mood stability. It’s achieve able achievement-ing, and as we all know, we need to feel like we’ve accomplished something here and there. For me, crafting has always been an excellent way, because I end up with a tangible something to show that I’ve done something. I guess that’s sort of why I like my pay-job as well — it might just be data entry and accounts, but I know that it’s important to keep everything ticking along smoothly! It is interesting that you should mention using knitting as a way of keeping your mood stable: I’ve been fighting with my brain more than is normal for me these past few months, and have done pretty much the same thing. I’ve taken up knitting and cross-stitch again, and the difference in how much my brain hates me is enormous. I wonder why this is? It also probably helps because they’re things we can put down; while they do represent a sort of commitment to make a thing, it’s not like being in a play, or on a sports team, or something that requires one to regularly commit time. So it’s nicer, ’cause the pressure is/can be off, considering.